There are many blog articles packed with great tips on how to create an amazing website for a restaurant. However, when it comes to bars and other night venues, information is limited. True, many of those tips apply equally to restaurants, bars, cafes and other food and drinks venues; however, each of those types would require a personal approach. Having developed websites for bars, restaurant and bistro type cafes, we've learned it takes a boutique Digital Agency to bring the creativity and budget together to deliver a bespoke solution. Here's a list of tips and tricks you can use to make your bar or venue website stand out! The worst mistake possible is creating a website that does not clearly represent your business. You could create the best website using the most amazing visuals, but all this will be of a little value if that website does not transmit a clear message about your brand. Consider Good Heavens bar in Melbourne with pastel paintwork on the walls that creates a tropical summery vibe even in the middle of winter. Good Heavens uses similar colour scheme on their website to make sure their branding is consistent on their online platform, as well as their physical venue. Another top Melbourne bar, Katuk, uses rich, dark tones to on their website to match the character of the actual venue. Using right images is extremely important to create a desired ambience and evoke particular emotions in your visitors. While food imagery is extremely important for restaurants; when it comes to bars, some venues don’t feature any food pictures at all. Rightfully so - bars and other nightlife venues are not the places people would normally got to eat. With your website imagery, make an accent on the ambience, emotions and the ultimate experience your visitors seek. This doesn’t mean that you should not use any food imagery at all, but consider incorporating photos of the interior, staff or your actual visitors and events. For example, while creating a website for Left Bank Melbourne, we used a series of short movie-style videos to create a sophisticated festive atmosphere that help set the right mood for the website visitors. Just like imagery, colours help create particular associations in users’ minds. Each colour has a unique meaning attributed to it, and your website colour scheme can make individuals feel either excited or comfortable and relaxed. Keep in mind that colours also impact usability; nothing is worse than a website with a poor contrast that makes the text impossible to read. To begin, use the already existing colour scheme in your bar or pub. This will keep your branding consistent and will help visitors avoid confusion when they are in your venue. Many bars opt for dark colours, using browns, blacks and dark reds. Those colours ultimately create the feeling of comfort, and relaxation potentially making individuals want to come back. Make sure all important information is easily readable and users can easily find what they want. This includes menu, location, information on events and promotions. For example, the website we created for The Social Bar has got all the important information on events, theme parties and happy hour drinks all on the landing page, making sure that it’s the first thing website visitors see. When it comes to the nightlife scene, in a city like Melbourne the options are endless. To stand out, you will need to focus on what makes your bar special in comparison with the competition. Is it your selection of vintage wines? Best selling arancini balls? Or maybe your unique cocktails and bartender’s skills are what attracts your customers? Whatever it may be, make sure you highlight what makes your bar unique and use it to your advantage. For example, being situated on Southbank, Left Bank Melbourne offers uninterrupted views of the Melbourne skyline - an advantage that is often mentioned on their website. 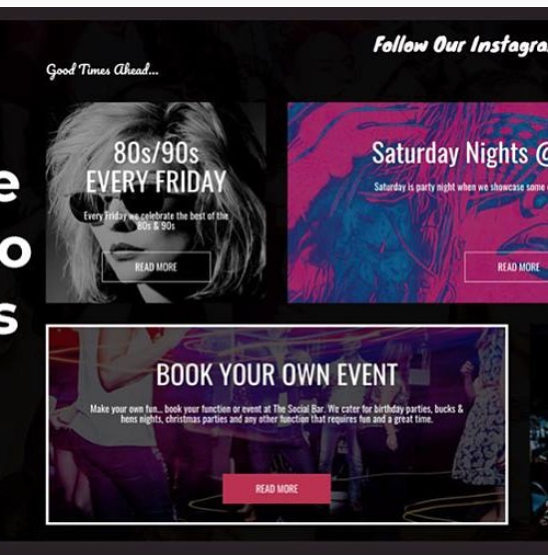 Do you need help creating a website for your bar or other entertainment venue? Or does your current website need some help? Check out our recent blog about the advantages of working with a boutique, Digital Agency. Or, reach out to our Click Creative wizards, just live chat or call us on 1800 0078 301... we would love to hear from you!